One hot day in February, the HEARsmart team were delighted to attend the City of Melbourne and Music Victoria’s first ever Venue Day. 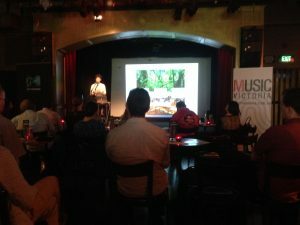 Hosted by the Toff in Town, there was a diverse mix of presentation from the City’s planning officers, to recipients of Good music Neighbors grants, to Green Music Australia encouraging venues to reduce their plastic waste. Our own PhD student, Siobhan McGinnity, gave a well-received presentation about the ongoing HEARsmart live music venue study and shared some new data fresh out of the sound level meters. She was also able to put out a call that we’re looking to get more venues on board with our study so that we can better understand ways of managing sound without impacting (unless the impact is to improve!) the patron experience. It’s work in progress still, but we’re starting to see some interesting and really viable opportunities. These presentations gave the audience plenty of food for thought during the day on how live music venues and other performance spaces can continue to make a significant social, cultural and economic contribution to Melbourne. As the afternoon drew to a close, ideas and information were being enthusiastically discussed by all attendees. It was great to see a group of people from different walks of life come together to discuss how best to support one of Melbourne’s internationally-recognised industries – its live music scene – and to have HEARsmart invited along to contribute. It is a wonderfully encouraging sign that the hearing health of punters and musicians is now seen as an important consideration in the exchange of ideas, which happened on the day.